Since dark, stormy nights are also excellent for staying indoors, they are also prime times for writing. This evening, a few little stories from recent past that have previously been sitting in a digital pile are moving from mere thoughts into narratives. I do hope you enjoy them, these anecdotes, this story being a selection from [Abnormal] Adventures in Normal Life. But oh, ought I feel even the least bit sorry for those who come from the genus Sciuridae, you ask? Sympathetic, perhaps? Earlier this spring, I was babysitting a 2-year old and took him to the playground on the way home from the Museum of Science, where we’d spent the morning running from this to that and back, observing the Fad or Flop exhibit (bouffant, anyone? ), and the most interesting sight of all – the broken elevator with a caution tape in front of it. It had rained the night before, and although then the day was clear, albeit grey, small pools of rainwater had accumulated in puddles on a few of the slides and tunnels. We had the entire playground to ourselves. I parked the double stroller alongside a park bench and put the brakes on, in the very unlikely likelihood that the earth would tilt and the stroller would begin careening towards the opposite end of the park and clear through the metal fence… Baby T took off for the swings, and then for the playground structures, running in the cold with tiny, bright green mittens dangling from his jacket sleeves. We ran around, and I joined in on the infectiously happy sounds of childhood as he let out yelps of delight, climbed up and down steps, and underwent the process of selecting an appropriate and not-too-wet slide to zoom down. I waited at the bottom. At a certain propitious moment, I had a funny feeling and looked behind me, to see the strangest sight. 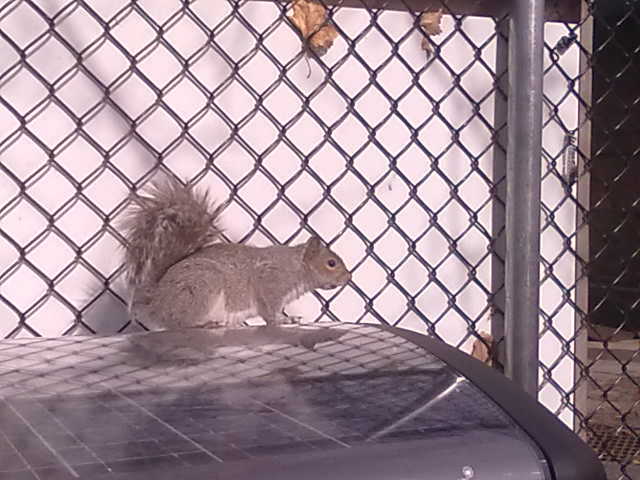 There was a fat grey squirrel sitting inside the double stroller. I stared for a moment, in utter amazement, and then ran at the stroller waving whatever I had in my arms at the moment, perhaps my own, large, non-green mittens, yelling at the squirrel. The Squirrel was unfazed by me running at the stroller, which was clearly the only spectacle in question: the Squirrel was, after all, seated and enjoying the show. The stout, portly Sir was seated, tail upright in the stroller, calm as could be, looking at me with a not-too-particular look. Clearly, he was having an identity crisis. I approached within 2 feet…then 1 foot of the stroller and made some form of a menacing gesture before it hopped up on the top of the stroller, perched, and began to rummage in the pocket wherein was contained a small, red, rectangular insulated lunch sack with a snack inside. Ah. So, Sir S wanted some snacks, did he? OH, NO YOU DON’T! I exclaimed, getting more and more … angry, perhaps? Sir S. got the point and leapt up on top of the wire fence and scampered. Not far. It came to rest after its brief Escape from Mad Babysitter journey beside the one break in the fence, which served as the unique entrance and exit to the playground. There it remained for the duration of our visit to the playground. I looked over my shoulder uneasily while Baby T tired himself out running around, keeping my eye on the Squirrel stationed by our exit as if it were waiting for us to come close enough for it to jump in the other side of the double stroller that would not be inhabited by Baby T. Sir S was also keeping what appeared to be a vigilant watch over the playground, myself, Baby T, and the stroller with snacks. Sir S, atop the Big Belly Trash Compactor. Eventually, Baby T was done and pink from the cold March air, and I buckled him into the stroller, said a little prayer, and began charging towards the gap in the fence, giving that squirrel the most menacing look I could muster, without feeling utterly ridiculous. As I made strides towards the exit, I could just imagine the Squirrel balancing on top of the Big Belly Trash Compactor, hind paws poised, ready to somersault, fluffy tail over head onto the stroller in one lumpy motion, and cruising out of the playground for a smooth ride around East Cambridge. 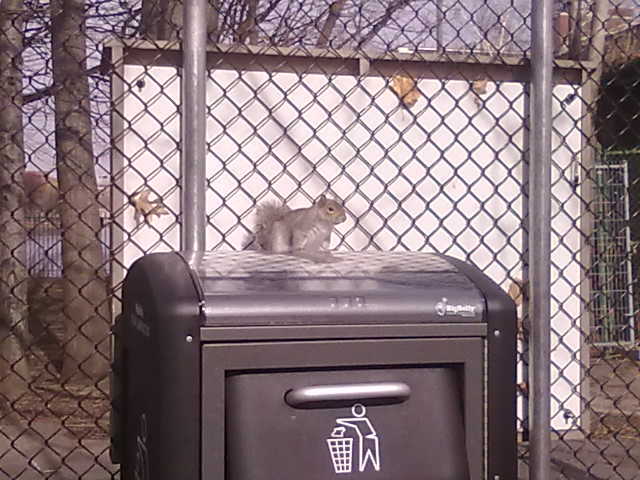 Fortunately, all my fears were allayed once I cleared playground threshold, without Sir S, who remained atop the Big Belly Trash Compactor, king of the energetically-conserved trash heap. Audacious Sir S. Keeping watch by the gate. Squirrels in Boston are known for their utter abandon when it comes to…shyness… and they exhibit rather social mannerisms. For instance, at the Boston Commons, they come right up to you when you are having a tranquil lunch on a bench, get up close to your toes and wait until you toss a fragment of lunch down to them (or over to them, if they also joined you and your party on the bench). They also can come and take grapes and nuts from your fingertips (I observed this during a friend’s college project on Animal Behavior). But, a squirrel in a stroller? Never. I never thought I’d see it, or have one in a stroller under my charge. Without intent to enrage, and certainly not to offend, I would like to gently offer a useful bit of counsel to you. Based on my close-range observation of the ensuing damage of what may have been a potential identity crisis, experienced by the known Sir S, I would like to remind you of your squirrely nature. There is nothing wrong with being a squirrel, please don’t get me wrong. However, although you may be well-barbered and neat in appearance, you are not a little boy and you do not ever, under any condition belong in a child’s stroller. I request that you remain at a polite (according to me, 3 or more feet away) distance from me or any people under 3-feet in stature who are with me. This also includes carriages under my charge, or belonging to me, and to any of my belongings. With this notice, I hope we can still remain cordial when we see one another at parks and playgrounds, but I cannot promise to be warm and even contemplate offering you a snack if you decide to breach this little request. Tags: audacious, Audacity of Squirrels, identity crises, kids, playground, Sir S., Squirrels, strollers. Bookmark the permalink.